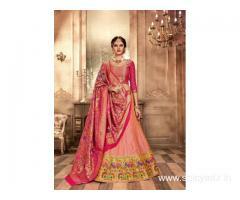 Embroidered net lehenga with dupatta available at Mirraw in affordable costs. Lehenga Details: Multicolor embroidered work in net fabric. Dupatta Details: Net in length 2.5 meter. Blouse Details: Blouse available as per image with embroidery work in 80 cm.